Maths Train is an exciting and imaginative way for preschoolers to work intuitively with early maths while having heaps of fun. Together they will enjoy exploring numeracy and quantities as they use the crane to load and unload bricks onto the brightly coloured train. The figures and engaging cargo and accessories encourage them to role play various functions and scenarios around the railway. Set features a train, five wagons and 23 railway elements. 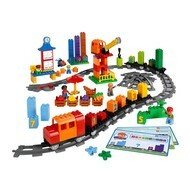 Includes a movable crane for loading and unloading the train LEGO® DUPLO® figures for character-driven role play.